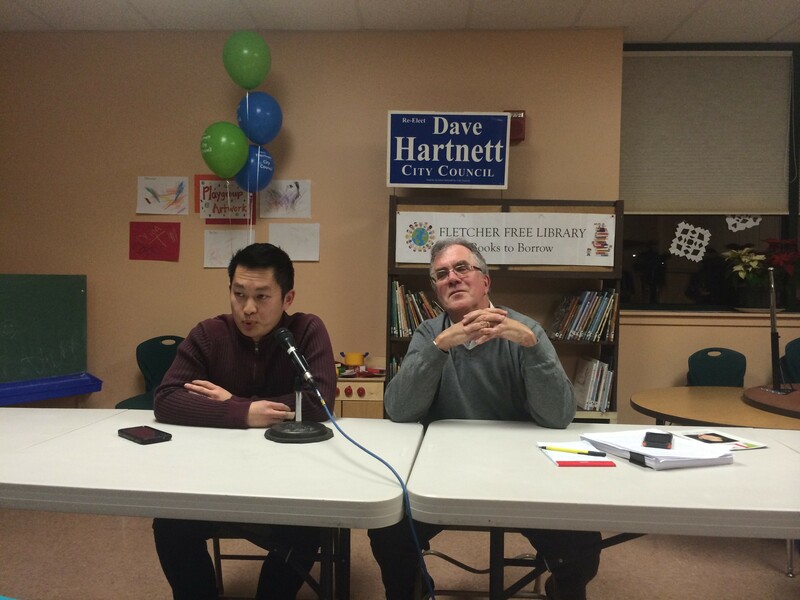 Republican Michael Ly, left, and Democratic incumbent Tom Ayres at a recent candidate forum. A Republican opposition research firm appears to be looking for dirt on a Democratic city councilor running for reelection in Burlington’s Ward 7. The Florida-based firm, Data Targeting Research, filed a public-records request with the city attorney on Tuesday asking for Tom Ayres' spending records during his council tenure. Alex Holzbach, who emailed the request from a datatargeting.com address, declined to comment on it when reached by phone. He also would not provide any information about his employer. On his LinkedIn profile, Holzbach is identified as Data Targeting's director of political research and operations. Reached by phone on Wednesday, Ayres' opponent, Republican Michael Ly, said, "I don’t even know what you’re talking about ... What is [the group] called?" Ly added that he'd just returned yesterday from the hospital, where he'd been since last Friday for the birth of his third child. Data Targeting Research’s website provides no information other than a phone number and a Gainesville, Fla. address. It played a role during the 2012 redistricting process in Florida, and a judge later declared that two districts had been gerrymandered in favor of Republicans. Last November, the Naples Daily News ran a profile of the firm's founder under the headline "Pat Bainter: The most influential man in Florida GOP politics you don't know." Ayres, who received a copy of the request from the city attorney, forwarded it to Seven Days. "I was quite taken aback when I got the news," Ayres said. "I’ve not seen anything like this." Burlington city councilors make $3,000 a year. According to Ayres, they also receive a roughly $1,500 stipend for policy research and constituent outreach. As for the paid staffers, the cellphone, the aircraft and the vehicle? "That's ludicrous," Ayres said. He has gotten no such perks, he said. The Democratic councilor said he wasn't nervous about what the request would turn up. But he noted, "I think it's an egregious waste of the city attorney’s time... To even put them through this 10 days before a municipal election is a ridiculous and fruitless exercise." City attorney Eileen Blackwood said she couldn't remember a similar request for information. During the race, Ly has repeatedly emphasized the importance of running a cordial campaign. "People probably will assume it's me, but I have no desire to do anything like that," Ly said. "To be frank, I actually have no personal problems with Tom. We are very cordial. We’ve met before about trying to stay clean [during the campaign]." Ly later contacted Seven Days to say that he'd reached out to Data Targeting and, in a voicemail, asked them to rescind their request. He told Ayres he had nothing to do with it. "I'm happy to accept that," Ayres said. 1. City compensation records for Ayres to include: salary, benefits (insurance, car allowance, or other benefits) and any increases in the same during Ayres’ tenure. 2. City compensation records for staff members who worked for Ayres during his tenure in office. 3. The official office budget(s) for Ayres including any corresponding receipts for itemized expenditures. 4. Any records related to Ayres' use of county issued equipment, including use of a cell phone, billing records of any such phone(s), and any text messages or pictures stored on any such phone(s). 5. Any expense(s) reimbursed personally to Ayres during his tenure in office. 6. The official calendar/daily schedule for Ayres during his tenure in office. 7. County Travel Records for Ayres to include: all records of travel (transportation/lodging/meals) funded by county dollars and receipts for the same; all records of use of county owned transportation to include use of all County aircraft or county vehicles and cost to taxpayers, including receipts, and; any other documents in your possession that pertain to taxpayer funded travel by Ayres.